[Elizabeth Sackett] was raised on the family farm near Gobles, Michigan. She attended the community school where she was a very good student and demonstrated outstanding musical ability, playing the violin and the accordion. She also was an expert horsewoman. In later years she continued to ride and participated in the women's relay races in the Calgary Stampede, for example. 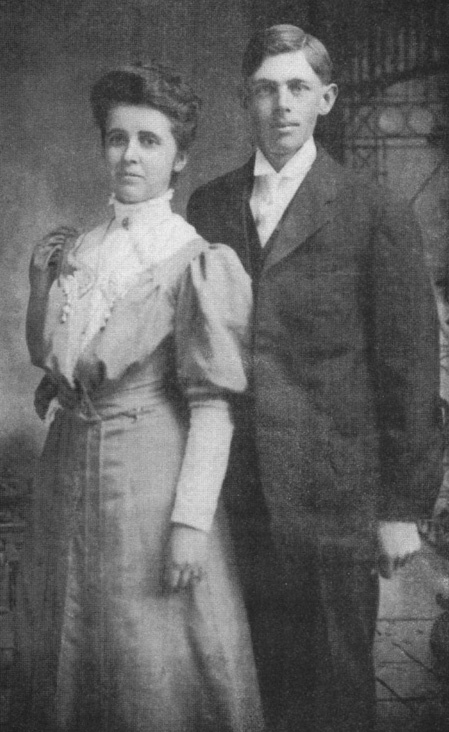 She married Alva Adina Coldsnow on December 24, 1906. He was the son of Frank Elmer Coldsnow and his wife, Eliza Jane Gilbert Coldsnow. He was born in Williams County, N.W. Township, Ohio. He was a steam engineer and also farmed. 'Lizzy" Pearl and Alva settled on a homestead in Western Canada about 1910 near the town of Coutts. Between 1910 and 1918 this was their home. Due to drought conditions they prospered only intermittently. They built a house and outbuildings and they proved up on the homestead. Alva's trade as a steam engineer made it possible for him to obtain work on neighboring farms that used large steam units for power. He also worked in the smelter at Trail and in lumber mills in the Nelson area. Thus his family had a good standard of living even through the worst drought in memory. However, he did have to spend long periods away from home and worried about leaving his family on the prairie even though they had good neighbors, and Pearl was fretful and lonely at times. So from time to time Alva sent the family back to Michigan where they could visit the Sacketts and the Coldsnows. Their daughter Mildred really did not like leaving the farm on those occasions and remembers crying every time they boarded the train. In 1914, the whole family came south to visit the Earl Sacketts near the town of Orient, Washington. Earl, at that time, had a sawmill, a grain threshing outfit and a dairy farm so Alva found plenty to do there. Mildred attended local school with the Sackett children. Twins, Stanley and Stella, were born to Pearl during that 1914, winter. The next spring they returned to their home at Coutts, Canada, where their affairs moved on as usual. Alva, of course, was discouraged and decided to leave Canada. He found another steam engineering job at the lumber mill in Elk, Washington. In 1920, Alva married a Gusta Muehier. With a home established in Elk, Alva brought his children west to live with them. Alva and Gusta had five children: Orville, Ethel, Yvonne, Millicent and Jack Coldsnow. Alva died on January 31, 1935, of a long-standing lung ailment and was buried in the Riverside Cemetery, Spokane, Washington. Andrew P Sackett, Ancestors and Descendants of Frederick Plummer Sackett, published by the author (1983), 134.